Christopher Graham of the Information Commissioners Office stated to the Home Affairs Committee set up to inquire into Private Investigators that there are, roughly, 2,000 individuals or organisations that have notified his organisation that they are involved in, “An investigatory process”. 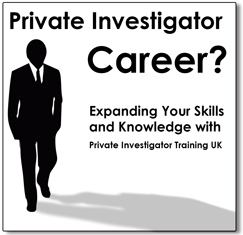 Not all investigators will be private investigators. By the same token, not all private investigators will have registered themselves with the I.C.O’s office under the Data Protection Act, so the exact numbers remain something of an estimate. The ex Police and ex Military Private Investigator will be able to use their core skills learnt in former lives and will often choose to specialise in surveillance, close protection, interviewing and specialist investigation areas such as forensics. The general investigator will tackle areas of work, like: process serving, interviewing, tracing missing people, stock loss, surveillance, and the like. The model or path which gave the Security Industry Authority the mandate to issue licences under the Private Security Industry Act 2001, is still in place and slight updates of this legislation will ensure that Licences can be enabled. Drop us an e-mail or make a call to let us know about your aspirations and existing skill levels. …One of our learners has pointed out, “When I first began researching into this field as a career path, I have to say it was a minefield. Many different websites were offering a variety of training material and, so called diplomas and certificates”. “I rang as they seemed to be the ones who knew what they were talking about, and I’m now glad I did”.